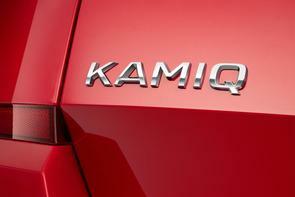 Skoda has confirmed that its new small crossover will be called the Kamiq. It'll be Skoda's third SUV model, slotting into the range beneath the existing Karoq and Kodiaq. Like those two cars, it takes its name from the Inuit language, from the indigenous tribes of northern Canada. Skoda says that it "comes from the language of the Inuit people living in northern Canada and Greenland and describes something that fits as perfectly as a second skin in every situation." It'll be based on the Vision X concept shown at last year's Geneva Motor Show, and it'll be in Geneva that we see the Kamiq in all its production-ready glory. Skoda has shown us a darkened image, from which we can see that the Kamiq will closely follow the Vision X's styling, including its very slim high-set daytime running lights, and main beam lights set lower down on the nose. According to Skoda, the Kamiq "Presents itself as an ideal companion to everyday life in urban environments and beyond. The name fits perfectly with the existing SUV model range as all Skoda SUV models will start with a K and end with a Q." Skoda says that the Kamiq will have a "higher seating position, better visibility, easier entry, and higher ground clearance," as well as the "expected numerous 'Simply Clever' features which have become synonymous with the brand just as much as the generous space available." It'll be based on the same MQB-A0 Volkswagen Group platform that you'll find under the SEAT Arona and Ibiza, the Volkswagen Polo and the incoming likes of Volkswagen's new T-Cross and Skoda's own Scala hatchback. Engines will range from 1.0 three-cylinder and 1.5 four-cylinder turbo petrols to 1.6 and possibly 2.0-litre diesels, with a plug-in hybrid model due by 2021. The concept was shown with a hybrid CNG natural gas engine, which could eventually make it to production, but there's no ready CNG supply in Ireland, so don't expect such a model to make it here, in spite of its emissions credentials.